Scrape mixture into a large bowl and knead until well blended. Pinch off a small piece of the mixture and press into your hand to make a flat disc. Put a small ball of Daiya in the center and roll the dough into a ball around the Daiya. Repeat with remaining mixture. Preheat to 375º. 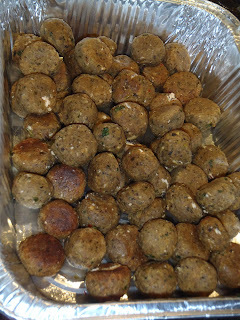 Oil a baking sheet and add balls to sheet. Bake 11 minutes. Remove and turn balls. Bake another 11 minutes. Serve hot. Preheat oven 350º. In a food processor, process beans, liquid aminos, oil, water, and wine until smooth. In a large bowl combine flour, nutritional yeast, onion powder, garlic powder, salt, thyme, sage, parsley, and black pepper. Stir wet mixture into dry mixture to make a soft dough. Knead for 3-5 minutes and shape into an oval loaf. Place loaf on a n oiled sheet of foil, and enclose it in the foil. Place enclosed loaf in a 10" baking pan. Add 1" of water to the pan and tightly cover entire pan in foil. Bake for 1 hour and 45 min. Let cool completely before slicing. In a large pot, over medium heat, sauté mushrooms, potatoes, carrot, onion, and olive oil about 5 minutes. Stir in liquid aminos and herbs. Add water, salt , and pepper. Cook over med heat about an hour. While keeping the broth, strain veggies from the broth and process them in a food processor until smooth. Stir processed veggies back into the broth. In a frying pan on high heat, melt buttery spread and stir in flour. Stir continuously and ladle in about 3 scoops of broth/veggie mixture. Cook on high, stirring, until thick and smooth. Stir this mixture into the pot of broth and cook on medium about 20 more minutes. In a pot over medium heat add oil, forbidden rice, bay leaf, and minced garlic. Sauté about 4 minutes. Add water and reduce heat to low. Cook rice for about 35 minutes until water is absorbed and rice tastes tender. Remove from heat. Let cool. In a nonstick skillet, over med heat, cook earth balance butter, onion and celery about 8 minutes. Add apples and cook another 5 minutes. Stir in herbs, salt, and pepper. Cook 2 minutes. Transfer to a large bowl and toss with rice, bread, cranberries, and walnuts. Preheat oven to 450º. Spread stuffing in a baking dish and drizzle with vegetable broth and olive oil. Cover with foil and bake about 20 min. Remove foil and bake another few minutes, until top is golden brown. Preheat oven to 400º. Cut vegetables into approximately 1" cubes. In a large boil stir in the rest of the ingredients. Stir well to combine. Spread mixture in a baking sheet. Bake uncovered in oven for an hour. Change oven setting to broil. Broil veggies on high for about 3 minutes. Serve hot. Preheat oven to 350º. Grease a 9x12" baking dish. In a large bowl, stir to combine the flour, sugar, baking soda, salt, pumpkin pie spice, and cinnamon. Add pumpkin, oil, coconut milk, apricots. Stir to mix well. Fold in most of the coconut saving some to sprinkle on the top. Stir in most of the walnuts leaving some to sprinkle on the top. Spread batter in baking dish, and sprinkle with remaining coconut and walnuts. Bake approximately 60 minutes, or unil toothpick inserted in the middle comes out clean. Allow to cool completely before serving. A fast, easy, warm, comforting meal that is easy on the wallet. Bon appétit! In a large pot over medium heat, add oil. Sauté onion, garlic, and potatoes 5 min. Add wine. Stir in parsley, oregano, fennel seed, paprika, pepper, cayenne, red pepper. Continue to sauté until wine is mostly absorbed/ evaporated, about 5 more minutes. Add crushed tomatoes, water, and bay leaf. Turn heat to low and simmer, uncovered. While that simmers, pour half of the can of chick peas into a bowl or food processor. Mash with a fork or process, until puréed. Add this purée and the other half of the chick peas with their juice into the pot. Add pasta. Simmer, stirring often, until pasta and potatoes are tender. Remove from heat and stir in spinach until it wilts. Serve hot. A slight change of plans leaves Sean and I without the RV for the next 6 weeks or so, on a cross-country road trip to the east coast, visiting with family and friends. So how do we live out of a Dodge pickup truck, on the interstate, for several days with a strict plant-based diet? 2. Pre-mix spice packets. This is so great for road trips or camping trips, and I've been doing it for years. In a ziplock bag or empty spice jar, I always pre-mix an italian seasoning blend, and in another I pre-mix a southwestern spice blend. These come in so handy on the road. Southwestern spice blend- equal parts chili powder, oregano, cumin, smoked paprika, chipotle powder, onion powder, salt, and pepper. 3. Research in advance. Know what stops you might want to take along your route to find good produce and bread. You can also look into veg friendly dining options in cities along your route, but if you're in the middle of nowhere, you should be prepared to feed yourself. 4. Bring easy non-perishables like rice, pasta, and cans of beans (don't forget a can opener!). Also stocking up on veggies that can last a few days without refrigeration or in a cooler is a good idea. Potatoes, tomatoes, kale, onion, & avocado are some great choices for your trip. A small bottle of olive oil comes in handy and travels well, as does tempeh or vegan deli slices for quick sandwiches. 5. Bring a trail mix to snack on. Dried fruits and nuts are fast, easy, and you can eat them while you drive. In a pot, add potato and water for boiling the pasta. When water boils, add pasta. After 5 minutes add beans (with their juice) and cauliflower. When pasta is al dente, add garlic and kale to water. Strain immediately. Return to pot. Stir in spice blend and olive oil. In a pan over med heat, add oil, onion, tempeh and liquid smoke. Sauté 5 min. Add rice, zucchini, tomato, and spice blend. Sauté just until hot. Serve immediately. * Great with corn chips or wrapped in a burrito shell. It's been almost 2 weeks here in Moab, UT. I've been so busy exploring, hiking, climbing and living it up, desert style. What an amazing place. I feel very lucky to be able to spend time here. But also felt guilty making hot delicious food and having fun, while my friends & family in NJ were being affected by hurricane Sandy in a major way. Not only without electricity for several days, but my parents home was badly damaged and they can't occupy it again for months. So here I am, fully prepared for a disaster of that sort, with solar power, a back-up generator, a 40 gallon tank of water, and a warm RV to sleep in, all the way out in the sunny Utah desert. They are all evacuated, huddled, cold, bored, worried and waiting out the power outage, with their belongings left behind. Some were left with nothing at all. What a helpless feeling. Thankfully they were all safe through the storm and are now trying to work together and help each other get some normalcy back. I hope to head there soon and help in any way I can. For now, some comfort food. My friend just brought me this butternut squash straight from the garden in northern Utah. The sweet orange flesh of squash balances perfectly with tomato, garlic, onion, fresh herbs and rice. Preheat oven to 350º. Cut squash lengthwise. Remove seeds. Put squash inside down in a casserole dish, filled with 1/2 inch of water. Bake about 30 minutes, until squash is tender. Dump remaining water. On med/high heat on the stove, heat a pan and add onion, garlic, crumbles. Cook 5 min. Carve out inner squash, leaving a 1/4 inch border to the skin. To pan with garlic and onion, add tomatoes, carved squash, oregano, fennel, parsley, olive oil, red wine, rice, and salt & pepper to taste. Mix together well, and spoon mixture into squash. Bake, stuffed side up at 350º 20-25 minutes. Serve hot.